Give your child lots of fun practice recognizing and writing numbers 0–10 with these worksheets geared toward the littlest learners. Kids can learn to trace and write their own numbers, count and record colorful objects, and add, subtract, color, sort, and draw until they’re confident in their number writing abilities. When they’re ready, have them move on to our numbers 11–20 worksheets! Join counting and primary colors with this worksheet on counting numbers up to 30. On this penny printable, kids practice tracing letters, counting coins, and they even get to do some fun coloring, too. 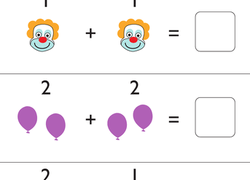 Adding up to 10 is as easy as counting balloons thanks to this worksheet! Kids practice adding single-digit numbers and writing the sums on this circus-themed kindergarten math worksheet. Winter addition will keep math skills warm during the long chilly months. This winter addition worksheet helps ease preschoolers into early math concepts. Ready, set... go! Start off subtraction with some picture equations, perfect for helping your child understand a new math concept. On this kindergarten math worksheet, kids trace the number 1, then write their own. Then they count the rabbits they see in the picture and make a graph. Great colorful pictures with a springtime theme keep learning subtraction fun for your child. Adding numbers within 20 is as easy as counting balloons with this colorful and simple worksheet. Practice counting and writing numbers with this simple worksheet, which challenges your child to look at each group of toys and count how many. 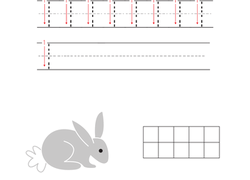 This worksheet will ensure that your kid gets plenty of practice adding with a number line. Get some mental exercise on turkey day by doing some simple addition problems with your kindergartener. This worksheet will help your kindergarten students practice identifying and writing each part of an addition equation. A counting worksheet for preschoolers, featuring a fish theme. Get little ones excited about math with some stellar subtraction practice! Put those counting skills to the test! Use the number line to help your child understand the basics of subtraction. She'll practice subtracting one. Is your preschooler ready to subtract numbers up to five? This beginning subtraction worksheet will have him counting and crossing out objects for answers. On this kindergarten math worksheet, kids trace the number 2, then write their own. Then they count the piglets they see in the picture and make a graph. 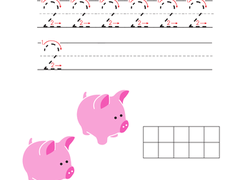 Addition, counting, and number writing practice is wrapped up for Valentine's Day learning with this math worksheet. On this kindergarten math worksheet, kids trace the number 3, then write their own. Then they count the sheep they see in the picture and make a graph. Practice counting objects this St. Patrick's Day with your young child in a fun way! Kids practice adding single-digit numbers and writing the sums on this ocean-themed kindergarten math worksheet. Kids practice adding single-digit numbers and writing the sums on this sports math worksheet. Practice subtracting by six with these animal picture problems! Kids will cross off six animals from each group. Challenge your kid to fill in the missing numbers from 1 to 50. This is an essential skill for understanding numbers beyond just counting them from memory.